ZTE unveiled a plethora of new phones at MWC 2012, and while the headliners like the ZTE Era may feature quad-core processors and qHD screens, we've still got time for the little guy like the Windows Phone Tango-running ZTE Orbit. But will the cheap and cheerful handset leave you feeling zestily refreshed like the identically named chewing gum? Or will it leave us with a bad taste in our mouths? Let's leave this simile that's not really working behind us and take a look. ZTE has obviously put a bit more thought into its phone designs for 2012 and, as such, the ZTE Orbit is not entirely hideous to look at. It reminds us of the mid-range Samsungs, particularly the Samsung Galaxy Ace Plus, with its rounded corners and metallic highlights. The 4-inch screen is a nice size and it's fairly bright (although we cranked the brightness all the way up and there wasn't much range to speak of). By today's standards, the ZTE Orbit is a fairly chunky handset but its girth isn't equalled by its weight which is quite low. Following the general trend, there aren't many buttons to behold on the Orbit. We've got the three soft buttons under the screen which are essential to Windows Phone handsets, a camera shutter button and a volume slider. Aside from that, it's just the power button on top of the chassis with the 3.5mm headphone jack nearby. The camera rocks a 5MP sensor and autofocus, with an LED flash to boot. The camera interface is very straightforward and although the hardware was a little slow, the resulting photos are generally of an acceptable quality, on screen at least. 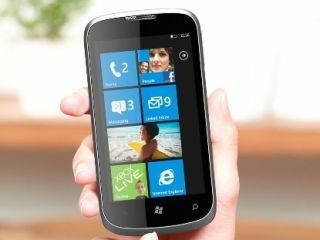 The Orbit comes with Windows Phone Tango, the iteration of Microsoft's OS that is meant to suit budget handsets. Despite this, the processor is a not-awful 1GHz affair which meant that the phone was fairly fast and responsive. The stripped back Tango features should only add to the speed of the thing. We've always struggled to type on ZTE touchscreens and, while the Orbit is a bit of an improvement, it was still a bit of a pain because the screen didn't always register where we had pressed or even that we had pressed at all. A low-end Windows Phone this may be but that doesn't mean you're in a for a low-end experience: it loads quickly, seems pretty responsive and doesn't look awful. In short: the ZTE Orbit is not bad. In fact, it may be playing at the top end of the low-spec Windows Phone handsets - and that's no bad place to be.